Skype has resently posted a BETA (2.8.0.324) download of their client on their site, but I could not find a link to navigate to it on their main site. A little digging around and trying different URL combinations and I scored. Try http://www.skype.com/download/skype/macosx/beta if you want to grab the BETA now. The real meat in this release is that it now includes screen sharing and sports a slightly new interface for the video window. 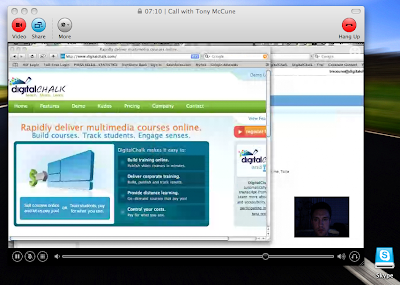 The picture below shows the new interface and a screen shot of our website while chatting with someone else.